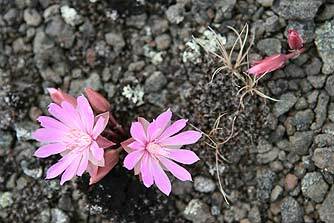 Bitterroot or Lewisia rediviva is an extremely drought-tolerant succulant which grows throughout the sage-steppe and surrounding pine-dotted montane ridges. 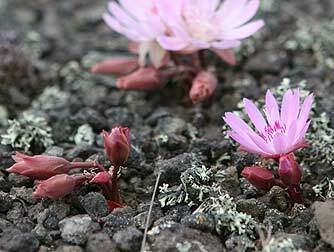 Indians throughout the Columbia basin and into the plains dug the fleshy bitterroot as a prized food source on early season forays, when the root was largest and least bitter. 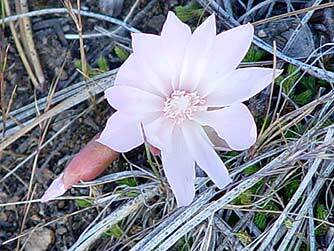 The Lewis and Clark expedition collected it in Montana's Bitterroot Valley and the genus is named Lewisia in honor of Captain Meriweather Lewis. 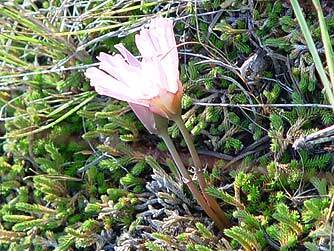 Its attractive flower is the state flower of Montana.